Hair transplantation has become widely accepted, safest and ideal solution to get rid from the baldness problem. 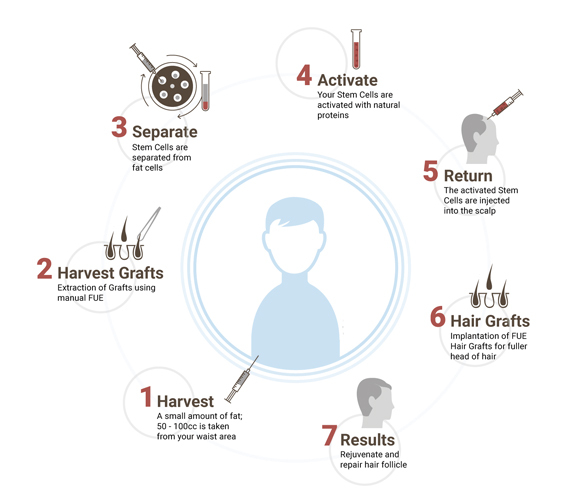 Although the restoration of hair follicles in natural way is the sure outcome of hair transplant procedure but to ensure the long life of transplanted hair many advancements have been done, one such advancement is the introduction of Bio-FUT. It is the combination normal FUT procedure and Bio therapy, which has been performed to give long lasting natural results. This procedure has been done to stimulate the stem cells of transplanted hair. To fasten the recovery and healing process of both donor and transplanted area, growth cells are injected in the donor and transplanted area, during this procedure. Bio FUE procedure in Jalandhar, Punjab has been done in basically two parts that are obtaining the growth factors and the other is performing the Bio-FUT surgery. Procedure is initialized by drawing patient’s own blood in small amount. Blood is centrifuged under the optimized conditions to separate the blood platelets. As in follicular unit transplant procedure strip of hair follicles is removed so for this according to the requirement of patient and extent of problem, length and width of donor strip has been determined along with the examination of quality and properties of follicles. After that strip of hair follicles is extracted with the magnificent tools without damaging the surrounding tissues and scalp to reduce the scars and wounds. Then with the advanced closure technique is used to close the wound caused due to extraction of strip. Recipient site of patient is prepared for transplantation by creating the microscopic holes in the scalp at the correct angle, distance and depth. Then with the latest techniques grafts are placed into microscopic holes carefully so that not any hole can remain vacant. On the same day of surgery, patient can get back to his home without any difficulty. Each patient is provided with the general instruction manual while leaving the center for post operative care so that results of the procedure can be optimized and potential side effects can be reduced. Patients are asked to visit center for regular checkups till the stitches get dissolved. After 3-4 months patient can have noticeable growth of hair but actual results can be seen within one year.